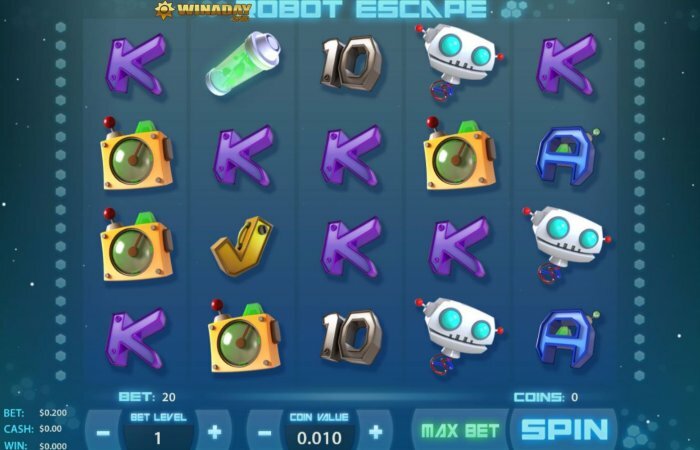 Robot Escape Online Slot is a 5 reel video slot with 20 active paylines and it is powered by Win A Day Software. This sci-fi inspired penny slot contains all original graphics to journey the player through space, spinning for some intergalactic winnings. There are two extra symbols to watch out for in this game that will help boost your chances of securing a win: The Free Spin symbol can trigger free bonus spins when at least 3 appear anywhere on the board at the same time. Players are awarded up to 10 free spins, depending on the amount of these symbols that show on the board. These symbols may even have their effect during the free spin mode as well, giving players increased chances of scoring a winning combination on the paylines for free! There are also Sticky Standard Wild symbols, which when they appear on the slots and take the place of any other symbol on the payline to boost chances of a win. They also will randomly stick in their position for the next round, often repeatedly, for a longer lasting bonus for players.